After a dismal first half, the Huskies pulled together enough gumption in the second half against Penn State to make for late drama. The future under Chris Petersen remains bright. Down 28-7, it was plain that Washington was not on the same level as Penn State. But after the Huskies rallied to have a shot to win the Fiesta Bowl Saturday afternoon, it was also plain that the Huskies were on a level commensurate with the heyday of Don James. That may not satisfy some fans following a 35-28 defeat that was more definitive than the final score. But Washington’s 22-5 record over two seasons and consecutive appearances in the New Year’s round of bowls suggests that reaching Penn State’s level is not far away. Looking behind them, the Huskies would seem a notch above their the Pac-12 contemporaries, who collectively went 1-8 in the bowl season mostly by margins greater than UW’s defeat, making the conference the Albania of Power 5 conferences. But conference doldrums are a discussion for another day. Saturday, the two best players at University of Phoenix Stadium decisively determined the outcome, and they both were members of the 11-2 Nittany Lions. RB Saquon Barkley and QB Trace McSorley were also the two best players UW faced this season. Together they overwhelmed the Huskies’ vaunted defense with opponent season highs in points and yards (545). “Barkley was as good as advertised — a phenomenal athlete,” said Huskies coach Chris Petersen, whose UW bowl record fell to 1-3. “The guy we were concerned about was McSorley. When we got pressure on him, he just ran away from us. If we didn’t get pressure he stood in there and threw it well. The 5-11 McSorley did a fair impression of a prime-time Russell Wilson, completing 32 of 41 passes for 342 yards, including an incredible 13 for 13 on third down, leading to 11 first downs. He also had 60 yards on 12 carries. Add the 137 yards on 18 carries by Barkley, plus 38 yards on seven receptions, and the Huskies looked in the first half as if they had no clue where to turn against such premier talents. “They were finding open holes and creases, and we couldn’t get them off the field,” said safety Ezekiel Turner. “The quarterback as a runner presents another threat. It might have been a tad better than the Alabama team that beat the Huskies 24-7 in the College Football Playoff semifinals a year ago in the Peach Bowl in Atlanta. In the regular-season, the Nittany Lions lost to sixth-ranked Ohio State 39-38 and to 24th-ranked Michigan State (which dismembered Washington State Thursday in the Holiday Bowl) 27-24. Some Big 10 Conference watchers have made the argument the Penn State at the end of the season was the league’s best. 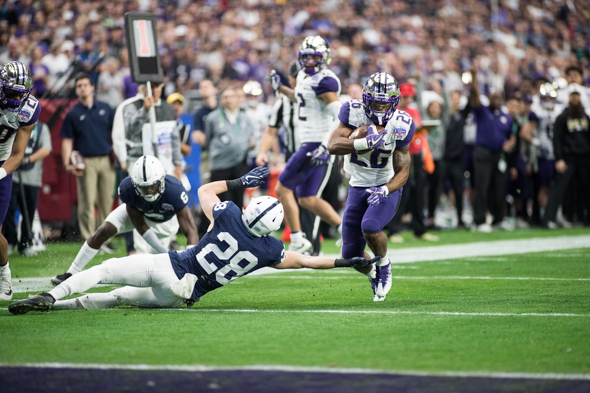 Whatever the case in the Midwest, Penn State was better Saturday, especially after Barkley’s 92-yard touchdown run in the second quarter for a 28-7 lead that made the Huskies appear to be moving underwater. “A top 10 team gets out to that type of lead, it makes it very very difficult to catch up,” Petersen said. “We went in at the half knowing we hadn’t played well on either side of the ball. The Huskies on offense were diminished during the season by the key injury losses of LT Trey Adams, WR Chico McClatcher and TE Hunter Bryant, and then in the Apple Cup had ankle injuries to WR Dante Pettis and RB Lavon Coleman. Clearly, Pettis and Coleman were not healthy. Pettis had a single reception, a screen pass he turned into Washington’s second-biggest pass play, 26 yards, but could be seen limping. He fair caught two punts. Coleman had four runs for 11 yards and a single reception. And Browning continued with some of his junior-year struggles. On the first drive of the second half, he had a perfect strike to WR Aaron Fuller for a 28-yard touchdown to close the deficit to 28-21. But in completing 18 of 28 passes for 175 yards, Browning’s response to the rush was erratic, and he missed numerous open receivers. The falloff from his sophomore season, when he was aided greatly by one of the fastest players in UW history, WR John Ross, will be one of the storylines that will extend into his senior season, which most people around the program think will happen. The Huskies can be heartened by a second-half uptick that was sufficient to give them the ball in the final minute, after Penn State missed a field goal, with a chance to tie or win the game. But after three incompletions from the Washington 28, Browning finally hit Fuller at midfield with a hook and lateral play. Fuller flipped the ball to Pettis, who reached the PSU 34. But instead of stepping out of bounds to preserve time for one more scrimmage play, he lateraled the ball behind him to no one wearing purple. “Had he got the ball over (a defender), I think there was a receiver there with a lot of space,” Petersen said. “We had Myles Gaskin coming up behind on the right side, but (Pettis) got pinned into the sideline. The failure of the long-shot play was secondary to the fact that Penn State was superior across the board. But if the view elevates to the 30,000-foot level where the 0-12 season in 2008 can be seen, the fact that the Huskies were motoring downfield in the final seconds with a chance to win a New Year’s bowl in 2017 against a powerhouse program says a lot about the ground that has been covered. As programs in the Pac-12 convulse, twitch and heave, Pertersen’s program hums along. Good article, Art. Let’s hope the Dawgs can solve some of their difficulties going forward, including all the injuries to their best players. Again, depth takes time. But Petersen’s sincerity, honesty and discipline are virtues more attractive than ever. We can sign all the top level skill position recruits we want, but just like the Seahawks (and like the Huskies vs Stanford this year and Alabama last year) it comes down to the trenches. If we don’t sign some major fatties, this is as high as we can go. They had a major fattie in Adams, and his loss was more than Petersen wants to let on. It takes time to develop the depth needed to survive major injuries. The Cougars can’t get to the end of the season with enough quality players. The Cougars’ problem is not the players. One word: McSorely. He was the best QB we have faced in a LONG time: passed, scrambled, ran and was a true leader. he did the same in their bowl game last year against USC, even though it was a close loss. It also exposed Jake’s arm – maybe he still has an injury issue after the surgery? He just has no pace on the ball and he never hits small windows. I was surprised, with the pass rush of PSU, that we did not throw more short, quick passes to the TE. We were not successful slowing their rush, and Jake’s feet are as slow as Hasselbeck’s, making the rush that much more effective. I agree with you Art – the Dawgs are rising and at this stage, do not have the depth to lose a number of first-team players and stay competitive. The Alabama’s, OSU’s, etc are so deep they can lose first team players and not be as damaged. CP is establishing an excellent program and every year they will get stronger. I continue to have a hard time with criticism of #3, who will leave the UW as the greatest QB in the long history of Husky football. He’s not perfect (neither was Don James), but can you imagine the past three seasons without Jake Browning at the helm? McSorely was good, especially on third down. BUT…he had 2 turnovers and very nearly 4. There are 3 or 4 Pac 12 QB’s as good or better than him. The biggest surprise was the ability of Penn State to run against the conference’s top rushing defense. Yes, Penn State was better, but Washington WITH their top OL, TE, McClatcher and a two-legged Pettis is pretty good too. Thanks for another exciting season. Next up: Auburn.